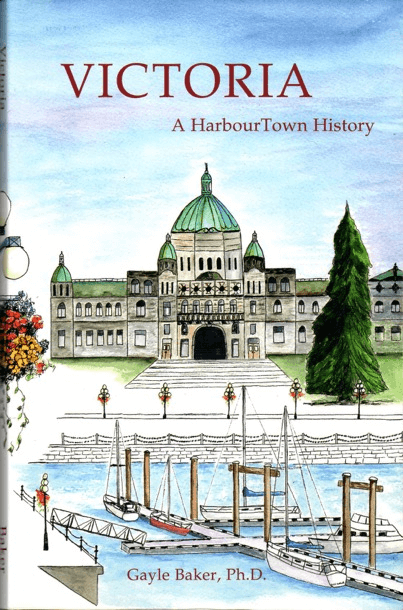 An attractive new book is on the market explaining Victoria’s history. This one is not an impressive 2” thick tome. It is not a boring summation of dates and facts. Victoria, A Harbour Town History by Salt Spring Island author Gayle Baker is a lighthearted look at the fascinating evolution of the city. Gayle Baker uses a pleasant, conversational tone to share personal stories of people whose names sound familiar to us because their names are now tied to the streets we know: Douglas, Blanshard, Dunsmuir and so many other men and women who were instrumental in forming the city of know today. How the first European arrivals dealt with the original citizens, how they decided to sell and buy land, create lots and eventually streets, is an interesting story. Douglas was one of the very first settlers and leaders. He married a first nations lady, and was a stubborn, dominant force in the city’s very early years. When Robert Dunsmuir came from Scotland with his wife, he promised her a castle. However, the couple ended up working in Port McNeill and living in a two room, dirt floor cabin. But, years later, Dunsmuir found coal and became one of B.C.’s wealthiest men. He did build his wife castle that still proudly stands today: the fabulous Craigdarroch Castle near Fort Street. Did you know that Victoria’s world famous Parliament Buildings were designed by a 25 year old architect who had a tragic love affair and was later murdered by his wife’s lover? These and many other fascinating, personal stories bring the development of our province’s capital city to life in this well written book.